I fixed a leaking throttle shaft in 2004. Low sulphur fuels cause seals and O rings to harden and leak. We also had a badly worn throttle shaft. 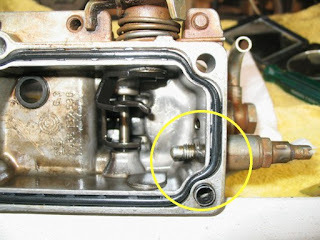 1) Don't remove the injector pump, it will upset the timing. The fix can be done in-situ although it's not very comfortable working on the pump from above. 2) Take photos the top of the pump so the throttle cable, adjusting plates and return spring can be reassembled in the same place. 3) Some manual dexterity with Allen keys is required to get the top cover off. You'll need Allen keys with a ball on the end as some bolts can't be accessed by a direct line of sight. 4) The throttle shaft is attached via a spring to the internal throttle lever and needs to be pushed through the cover to the inside. Ensure nothing falls into the open pump while the cover is off. 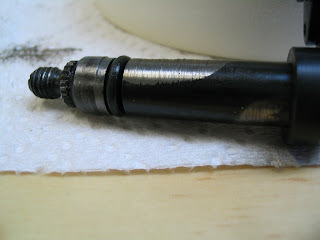 Notice the wear on the old shaft in pic below. I wonder where the bits of metal swarf went? 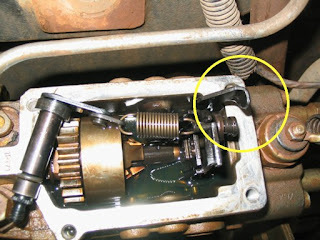 5) The replacement throttle shaft bush needs to be pressed into the cover. A local machine shop did this for me for $20 in about 1/2 an hour. (See pic below. Bush is in top left corner). 6) When replacing the pump top cover, I attached the internal throttle spring between the new shaft and the lever and then fed the shaft through the cover from the inside (with a new O ring) before replacing the top cover. I found it impossible to attach the spring after the shaft was inserted though the cover. 7) The internal spring loaded throttle lever needs to be held forward so it doesn't foul the adjusting screw on the cover. (See yellow circles on pics below). I pulled the lever forward and held it with a piece of wire until the cover was partially located and then removed the wire and finished fitting the cover. 8) You may need to reset the max and min throttle settings after replacing the shaft. Hope this helps. We've done 70,000 kms since fixing the throttle shaft with no more leaks from there. However in 2007 I discovered a leaking O-ring seal between the body and rear distributor housing of the pump which I shall have to fix one day.